Centuries ago a table was a loose plank of wood on top of tree stump or a couple of saw horses with boards on top. Putting weight on one’s elbows would unbalance the table, sending everyone’s food and what cutlery there was tumbling to the ground. Not putting elbows on the table prevented embarrassment. Modern tables are solid enough to support a body’s weight, but children are still taught the rule without the reason behind it. 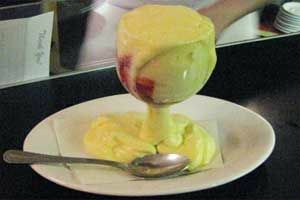 Feeling discomfort with elbows on the table is cultural; where people know what is correct and once understood why. People with manners. 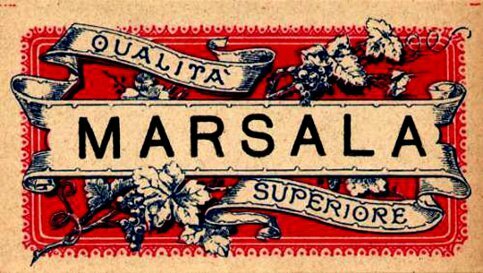 Italy was the first country in Europe (even before it was actually a country) where manners mattered. Italian were also the first Europeans to acquire and properly use the fork, and thus set their tables with the full set of cutlery. When attending a dinner in Italy (or France), however, leaving your hands on your lap, will appear quite rude to the locals. You are supposed to put your wrists on the table, but not your elbows. This not, as many foreigners would suspect, because something untoward might be going on below the tablecloth. No, it is all about politics and murder. In the 17th century French King Louis XIV uncovered a conspiracy to poison his wine and food with la poudre de succession (the succession powder), a fashionable mixture of arsenic and an extract from the glands of toads. The famed affaire des poisons (1677-1682) began with the natural death of Godin de Sainte Croix, a French army captain, when a strange powder was discovered in a box together with letters belonging to his mistress, Marie Madeleine Marguerite d’Aubray, Marquise de Brinvilliers. The powder was poison and the letters revealed the murders of her father and brothers with la poudre de succession. The Marquise fled to England and was eventually arrested in a convent in Belgium. She was brought back to France, tortured until she admitted her crimes and gave the names of her accomplices. The investigation led seven years later to a woman known as a brewer of aphrodisiacs and poisons, a midwife, and an alleged witch, Catherine Deshayes Monvoisin, known as La Voisin (“The Neighbor”). Before being burned at the stake, La Voisin opened her secret address book, revealing the names of her numerous and prestigious clients, who purchased both love potions and poisons. This resulted in a permanent paranoid atmosphere at the court of Versailles, where almost everyone could have been suspect. More than 350 people were arrested and about 200 sent to jail. Of the condemned, 36 were executed; five were sentenced to the galleys; and 23 to exile. 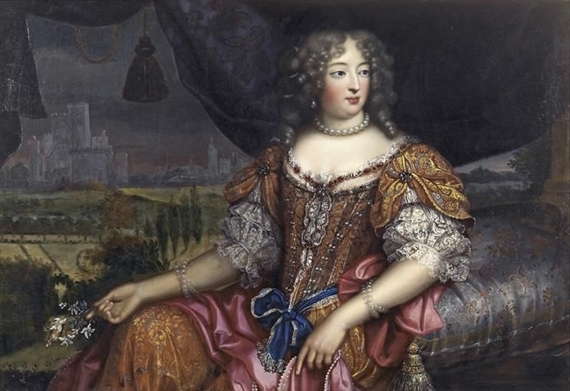 The investigation was suddenly suppressed by Louis XIV, himself, in 1682, when among the clients of the poison-maker, he was shocked to discover his own ex-mistress, Madame de Montespan, whom the Sun King had replaced by the younger Mademoiselle de Fontanges. Madame de Montespan was so desperate to regain the attention of Louis, that she asked La Voisin for love potions. 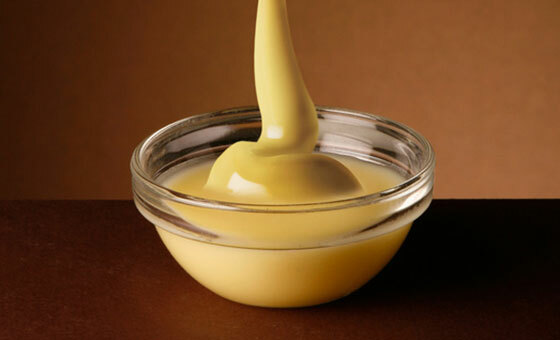 According to testimony at La Voisin’s trial, they repeatedly carried out rituals that would create a special elixir for the King. The transcripts report that La Voisin and the Madame de Montespan would call on the devil, and pray to him for the King’s love. 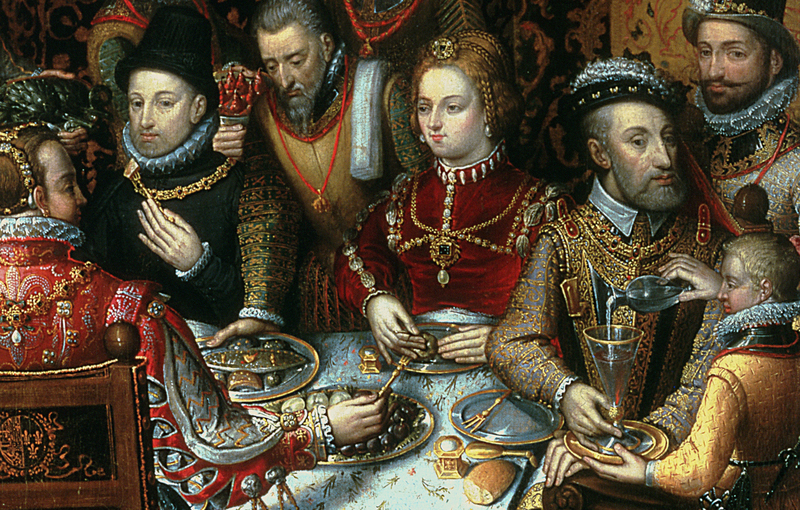 The king, not taking any chances, declared that at all meals, both hands and at least half of both forearms were to be seen on or above the table at all times. For much the same reason wine must never poured underhanded. Always place your hand, palm down, when pouring wine. 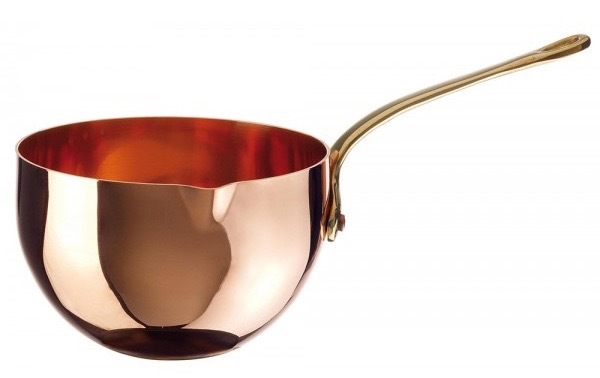 This prevents the pouring of poison from a hollowed-out ring into a glass as the wine is being served. 17th century Italians were enthralled with the French affaire des poisons and followed the court gossip closely. Soon polite society throughout Italy picked up on the hands-in-plain-sight practice at the table. Of course, it is easy for the Italians and French to keep both hand above the table line because, unlike the Americans who cut their food with a knife in the dominant hand and then switch the fork to that hand to spear the bite (the “cut and switch” practice), Europeans rarely put their silverware down between bites. The European style is to hold the fork in the left hand and the knife in the right. Once a bite-sized piece of food has been cut, it is conducted straight to the mouth by the left hand. For other food items, such as potatoes, vegetables or rice, the blade of the knife is used to assist or guide placement of the food on the back of the fork. The tines remain pointing down, which may be why peas are rarely served in Italy. The knife and fork are both held with the handle running along the palm and extending out to be held by thumb and forefinger. 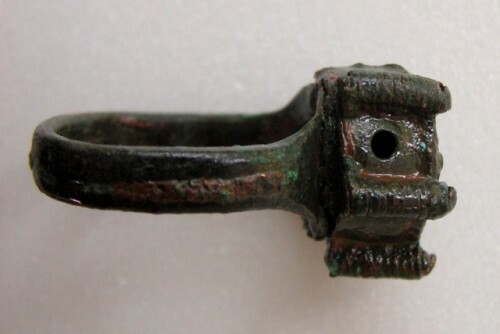 This style is sometimes called “hidden handle” because the palm conceals the handle. When in Italy, remember to keep both hands on the table at all times by trying to eat in the European style. And never pour your neighbor a glass of wine underhanded, it’s considered bad luck, even if you aren’t wearing a ring full of poison. 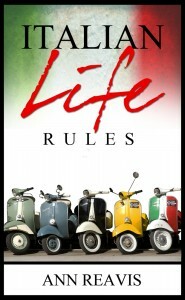 Italian Food Rules available at Amazon.com. 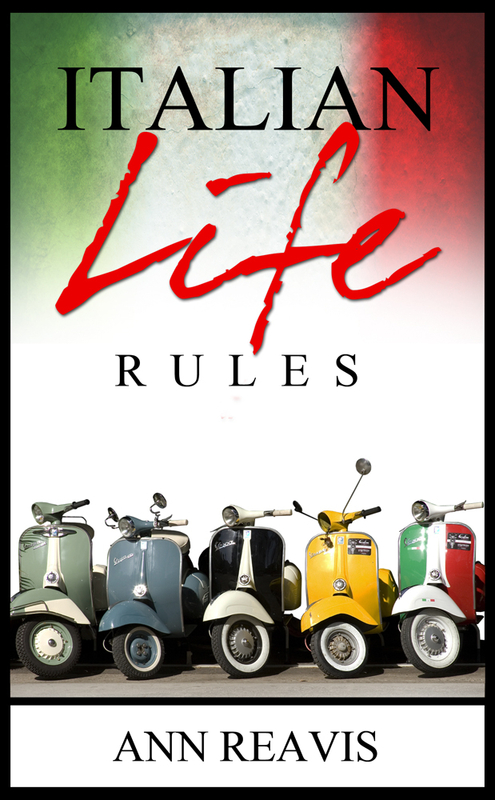 Italian Life Rules available at Amazon.com.